Investigators from the Rancho San Diego Sheriff's Station want your help in identifying and locating two suspects wanted in connection with a series of armed robberies that happened between October and December 2017 across San Diego County. The so-called "Grinch Bandits" have held up businesses in Spring Valley, San Diego, El Cajon and National City. The suspects entered each location in a similar manner. 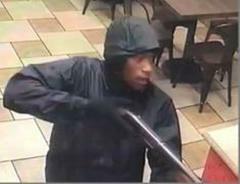 The first suspect walked in, pointed a shotgun and the clerk and demanded money. 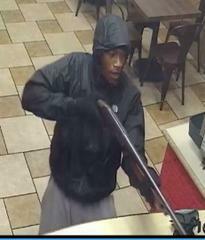 The second suspect then took the money from the register. Suspect #1 (seen in the photos attached to this bulletin) is described as a black man standing around 6' tall and weighing about 175 pounds with an athletic build. Suspect #2 is described as a black man standing around 5'9" tall. The "Grinch Bandits" should be considered ARMED AND DANGEROUS. IF YOU SEE THEM, CALL 9-1-1 IMMEDIATELY. If you have any information on the identity or location of the "Grinch Bandits," call the Crime Stoppers anonymous tip line at (888) 580-8477. A reward of up to $1,000 is being offered to anyone with information that leads to an arrest in these cases. 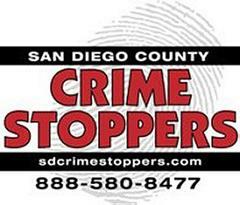 Please visit www.sdcrimestoppers.org for information on how to send a web or cell phone tip.